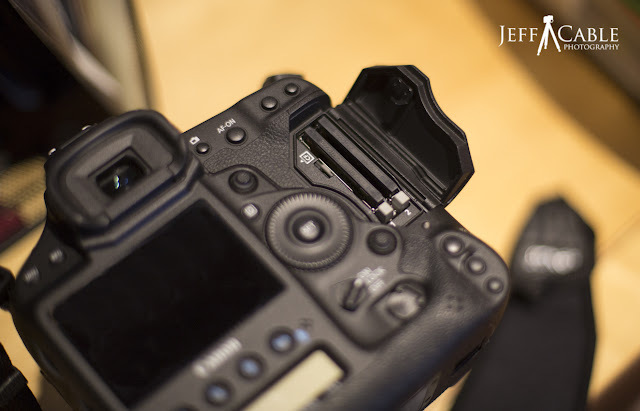 Jeff Cable's Blog: Using 2 high capacity memory cards in one camera: How about an in-camera SSD? This is a really interesting idea. I'm getting more and more paranoid about data loss everyday (I have my Drobo on order). I'm using a D600 which is my first camera to have a dual slot. I've been loading it with two 32 gig cards and just using the second card for spillover in case I don't have the chance mid-event to swap the 1 slot card. More and more I realize that I never even have to go near the 2 slot. Maybe taking the hit and getting a monster SD card, and leaving it in the 2 slot as a monthly backup would be an awesome idea. If the month goes by and I didn't "whoops" and delete anything before getting it backed up, I can just reformat the card and start again. 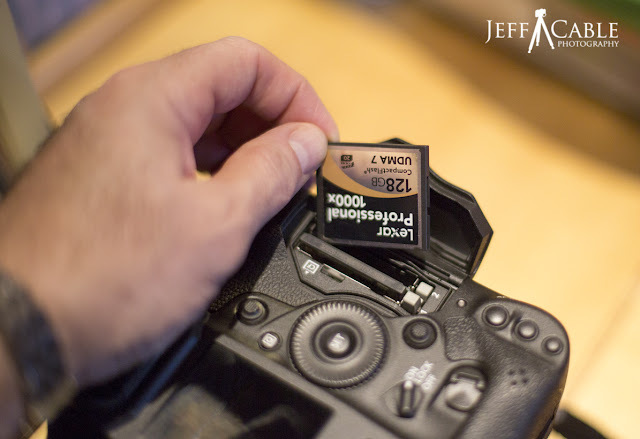 Do you think using SD cards instead of the compact flash cards will impact the cameras write speed or buffer? I think you would be fine using an SD card in the second slot, provided that you get a reasonably fast card. I would recommend a 600x SD card, unless you are using older CF that is much slower. I am doing exactly what you describe. Now that I have shot all these images and downloaded them all successfully, I could reformat the second CF card and start over. The only reason I have not done that, was to see how much I could fit on there. I wonder if you would feel any different if you had a one memory card camera. Would you still use a large capacity card? Really such a nice information on memory card.Thank you very much for posting this info.